This is a very straightforward install. Please note that this does not cover any wiring of the senders, just the installation of the bolts. Also, I am in no way responsible for someone messing up their car. Your oil system is crucial, if your not competent then don't do this!! If you want the information on were I got the bolts PM me, they have more made and ready to ship. I can say he was very helpful with the install, answering several questions I had.. In the rx8, there is little space available next to the firewall, making accessing the oil filter a pain. 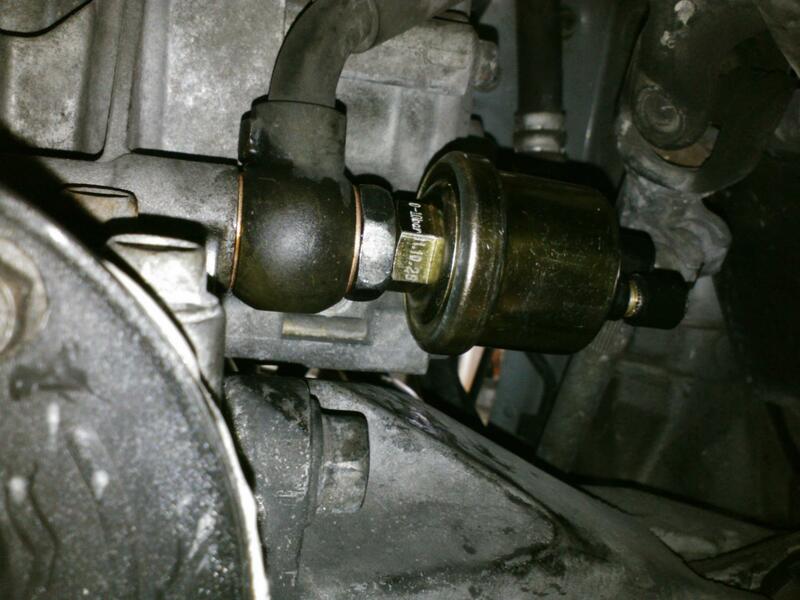 Adding an oil filter sandwich adapter makes this even more of an issue. With these modified banjo bolts the spacer is not needed. One replaces the banjo bolt attaching the oil cooler line to the front cover, and the other replaces the bolt securing the line to the cooler. 1: put car on ramps and place wheel chocks behind rear wheels. I found ramps to work well; since I did not drain the oil I only lost 1/2 a quart since the front of the car was higher than the oil pan. 2: remove or pull back the underside of the drivers side splash guard to access the underside of the oil cooler. I just pulled mine back, there is not a need to remove the whole thing. 3: here you will need the 23mm spanner. The bolt closest to the drivers side goes to the next oil cooler, the one passenger side is coming from the front cover. My picture shows the one on the drivers side removed; you want to OTHER one, the passenger side. We want to measure the temps of the oil before it is cooled, as it comes out of the engine. The bolt is on there tight, but with enough force it will come off. 5: DO NOT REUSE THE OLD CRUSH WASHERS!! Buy new ones. It will save you a huge headache and possible ruined day/week. they are $0.99 each at Napa, a cheap insurance. 6: put one new crush washer onto the bolt, slide it through the oil line, put another crush washer on, and bolt it to the oil cooler. The torque spec is 24 ftlbs. NOTE: do not use any sealant/tape here, thats what the crush washers are for. using these could result in a clogged oil line!! Mod Edit: The factory service manual indicates that the torque spec is 39.4 to 50.5 ftlbs. 7: wipe off any remaining oil, but do not re-secure the splash guard. 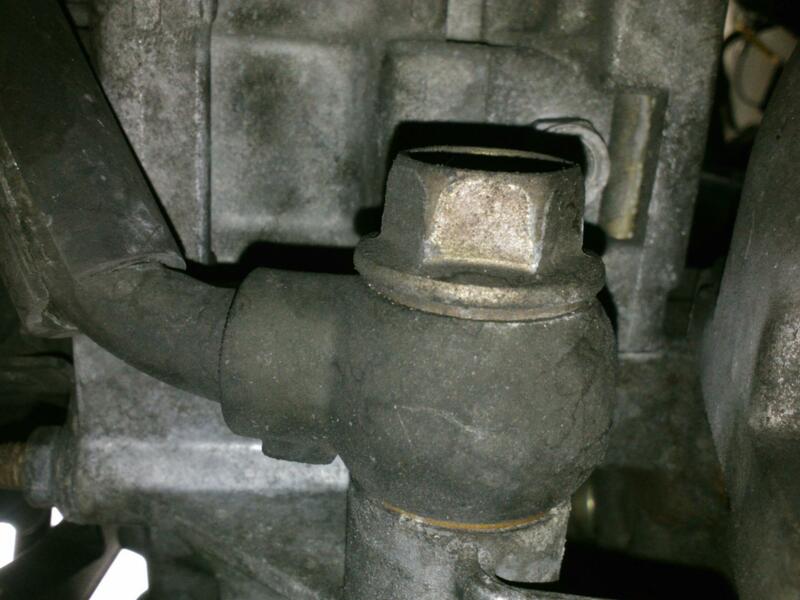 1:this bolt is located directly under the A/c compressor. There is only one banjo bolt there, so there is no mistaking it. It is EITHER a 23mm or 19mm. I have seen it as either size, depending on the car. regardless of the head size, the shaft and threading of the new bolts fit perfect. 2: with a 19mm socket remove the old banjo bolt. 4: put a new crush washer onto the new bolt, slide it through the oil line, place another new crush washer onto the bolt and bolt it to the front cover. the torque is 24 ftlbs. NOTE: do not use any sealant/tape here, thats what the crush washers are for. using these could result in a clogged oil line!! 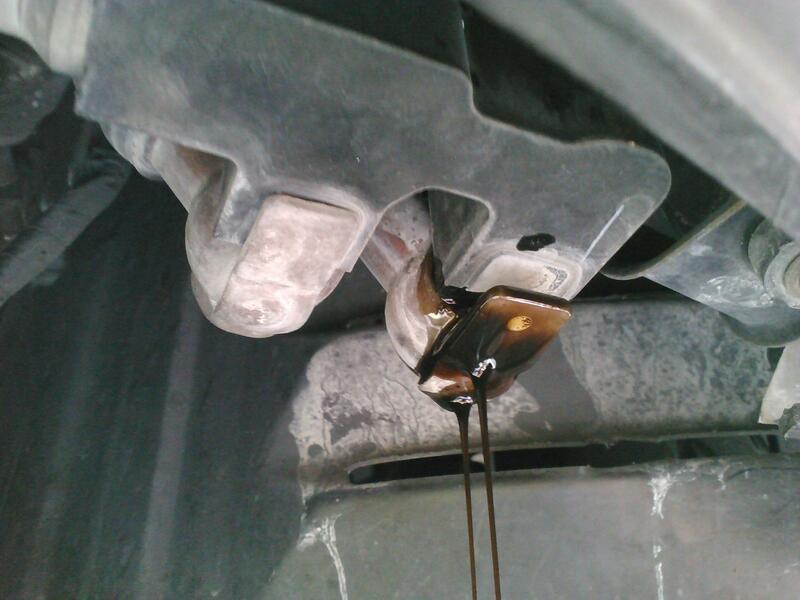 5: check oil to ensure proper levels. 6: start car, check for leaks. if you have under/over tightened the bolts you could have leaks. If they are under tightened tighten them. If you over did it, replace the crush washers and try again. 7: Now you can reattach the splash guard your done! Last edited by RIWWP; 10-14-2013 at 11:32 AM. interesting idea. The oil temp is very handy for us S2 owners that do not want to replace their pan drain plug with the temp sensor. Nice write up. 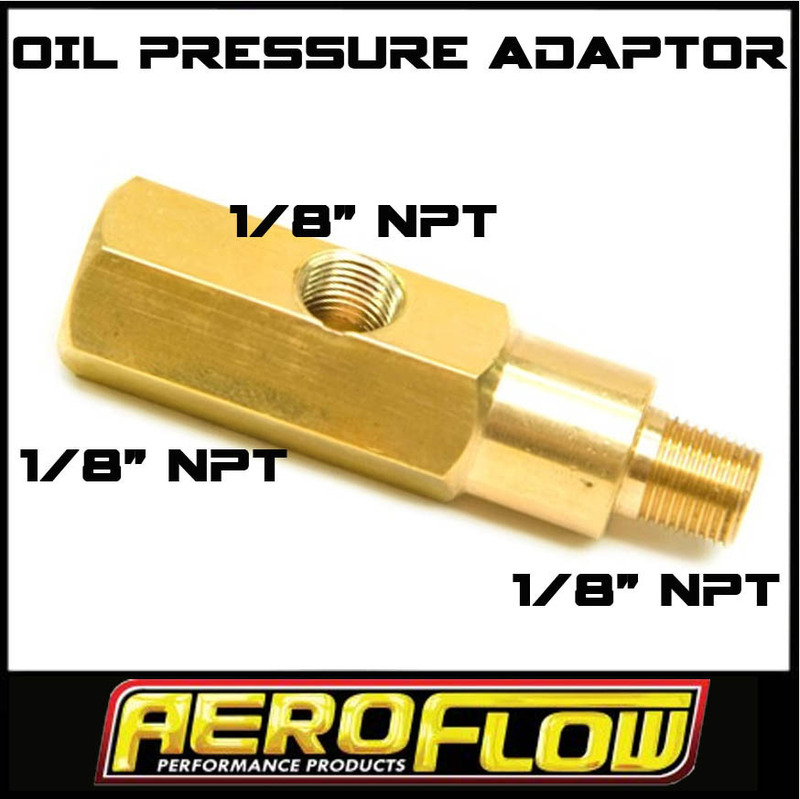 I had thought of doing this but using an oil filter adapter plate is just easier all around. But if you want more than one temp/pressure position then this is a great idea. My RB filter plate is coming off soon to be replaced by the banjo bolts. It makes more sense on every level; ease of access to the sensors, more access around the oil filter due to it not being raised up, etc.. I don't have any leaking issue or anything like that, but it costs a lot more than the bolts if that matters. this mod is a win all around, wish I had thought of it. Last edited by TeamRX8; 01-14-2013 at 11:29 PM. I figure while I'm updating to the AiM dash display I might as well straighten out some of the related stuff, had no real reason to mess with it otherwise, but will put it up FS with the the soon to be deleted RB ashtray gauge display. I know that my sensors won't protrude into the banjo bolt entrance/exit hole area. I agree now. Corksport sells a product for this very purpose (for the RX7 but it works on the 8) and it makes things nice and tidy. Shady got this product a couple of weeks back and it is a bit expensive (a bit more than what the crook charges) but it's simple and effective. Last edited by 9krpmrx8; 01-15-2013 at 12:28 AM. I don't mind, the Corksport piece is a really nice machined piece and I don't have to worry about whether I will receive it or not. Let me second this point. Lightly screw in the sensor you have and make sure it doesn't significantly cut into the flow path. An adapter may be required to space it out. Also, with my AEM 0-5v oil pressure sensor banjoed into the oil cooler feed line at the block, I'm not getting stable readings. I suspect that it's picking up pulses from the oil pump that it didn't see when mounted under the oil filter. Anyone else have this problem? Later on, I'll try switching the pressure and temp sender (located on the entrance to the LHS oil cooler) to see if that fixes the problem. The downside it that due to the bulk of the pressure sensor, it's very close the the fender liner and a blown tire or chunk of road debris just might break off the sender. And, btw, I got the bolts from the vendor-who-shall-not-be-named, just fine. Last edited by HiFlite999; 01-15-2013 at 09:54 AM. This modification is just drilling and tapping a 1/8bsp hole in the end isn't it ? Or is there more to it ? 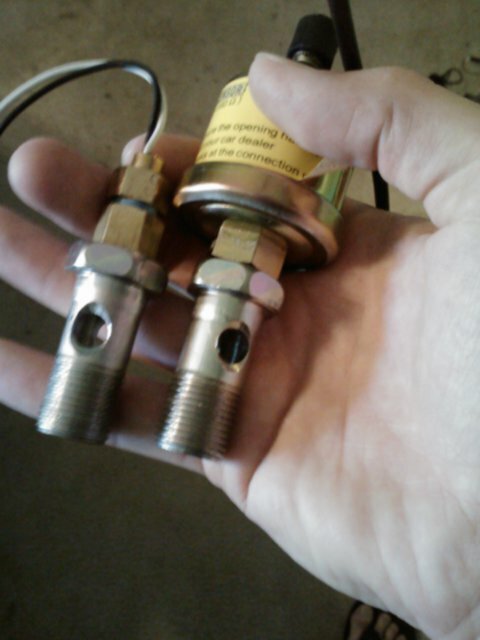 both the vendors listed so far have the sensor connection spaced out from the bolt head, just using different methods. Yes, but one spacing doesn't fit all. 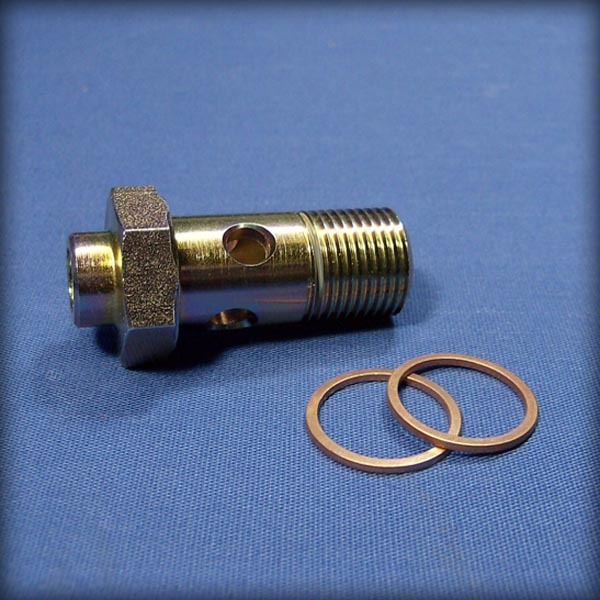 Sensors from different sources can have different spacing from their threads to the tip. I am preparing to do this modification. This will actually be the first thing I have done to this car since I've owned it. I was going to use the adapter plate, that seems pretty common, then came across this thread. I will be getting the banjo bolts to install the sending units. Is this a good place to install a sensor for pressure as well? If not please indicate the best place for a sender. I am sourcing material now and would like to have everything I need before I turn the first screw. 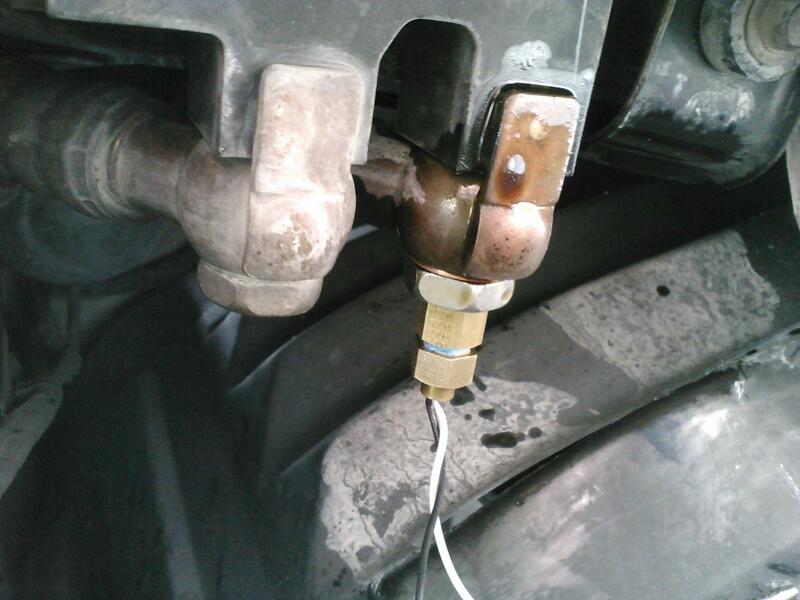 In addition have any of you used the Maxtow series of gauges MaxTow Truck Gauge Series ? I am leaning this way, but would like some feedback as to quality and more importantly accuracy if anyone has any information on them. It indicates they are for trucks, however they are the standard 52mm. I received all the parts two days after my order, with the exception of RX8 performance. Seems I ordered his last one so he had two make another production run to fill my order of 2. One quick call to Scott and he explained what had happened and all was well. They shipped when he said they would. I would just like to add a note on the crush washers. Napa had them, but they were not labeled, just in a large bin of washers. Not feeling to good about this I went ahead and purchased them, but went to Mazda for the washers. Turns out they had them, and they were cheaper than NAPA? If you decide to do this mod the Mazda part number for the crush washers is 995621800 I just returned the NAPA ones. However they would have worked, I just prefer OE parts when I can source them and especially when they are cheaper. The gauges are great, I chose the HALO series as they go black when not in use. It was tossup up between the Maxtow, but the color was not really working for me. If they change color they should emphasize that, otherwise I would have gone that route. After many years of ownership of this car, this is my first mod. I love being able to monitor these critical items. Thanks again to the OP for an awesome idea for the bolts. Seems putting the Temp sensor on the oil filter Banjo Bolt would make more sense, as you would read the temp right out of the engine. instead of reading it after one of the coolers. Has any one used a fitting to allow both pressure and temp to be attached to the oil cooler banjo bolt that is located on the motor?